Spend 10 minutes researching the early history of ska and you’ll be reading about Alpha Boy’s School in Kingston, Jamaica. 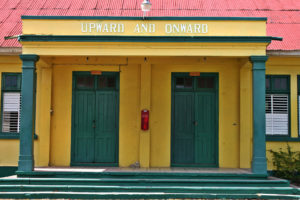 Founded in 1880, over the years it served many roles before settling in as an orphanage, vocational school and home for so-called wayward boys. 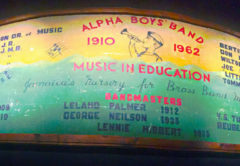 It was also home to a music training program that helped Alpha boys find jobs in the island’s many resorts and hotel big bands. Alpha alums Tommy McCook, Dizzy Moore, Lester Sterling and Don Drummond went on to form the Skatalites but they were far from the only former Alpha students to make a lasting impact in the music world. 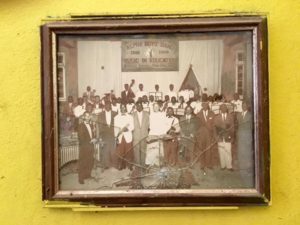 Alpha Boy’s School: Cradle of Jamaican Music by Adam Reeves and prolific ska-historian Heather Augustyn helps round out the story of the legendary institution. As of this post, Adam and Heather have never been in the same room. Heather lives near Chicago and Adam in Brighton, UK, and the book was an online collaboration. I figured it worked for them so we did the same with this interview. 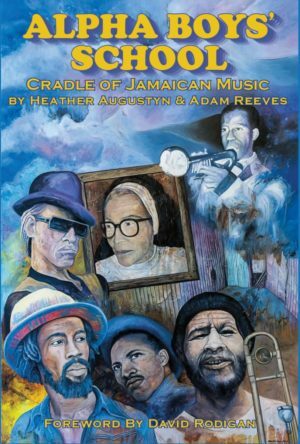 Alpha Boy’s School: Cradle of Jamaican Music presents information in a biographical dictionary approach. How did this approach help (or hinder) your research and writing? Adam: Approaching a subject this big could have been quite overwhelming but by just covering one musician at a time it became attainable. As you dip into the book, little by little a picture is built up of something truly colossal, but it’s only through these individual stories that the sum of their parts is fully appreciated. Heather: We came to this format organically, though. Adam had an affinity for the later styles of Jamaican music, and I had an affinity for the earlier styles, so it was a natural fit that we would split up the biographies according to our tastes and interests. That’s not to say that we had a few musicians we had to do battle over! Sister Mary Ignatius Davies holds an almost mythical place in the history of Jamaican music with some saying that without her, there’d be no ska and therefore no reggae. What role—if any—did she have in shaping the island’s musical heritage? Adam: I’m not convinced by the line of reasoning that there would be no ska or reggae without her. While the impact of Alpha is obviously immeasurable, I think that the musical drive was so strong in Jamaica and there were enough high quality non-Alpha trained musicians that something great would have happened there with or without Alpha and Sister Ignatius. 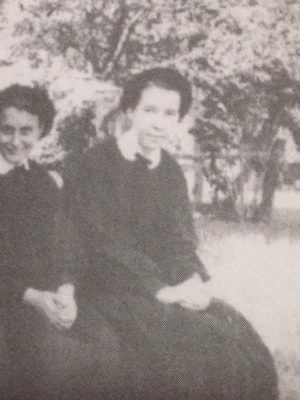 Her contribution was to take over the music department in 1939 and run it for the next 64 years. She built the music department into something robust that consistently turned out top-notch musicians by developing a reliable formula. This consisted of enrolling fine bandmasters along with a mentoring system whereby older boys would share their skills with the younger ones. Ignatius inspired boys with her enthusiasm for music and an uncanny ability to spot untapped talent. She impressed her boys with her musical knowledge and in the 1960s she actually bought a sound system to inspire them to gain an appreciation of what she considered to be good music such as jazz, rhythm ‘n’ blues, Latin, and of course ska. Her role in affecting the musical heritage of Jamaica I think was to help raise the standard of musicianship on the island. Any musician will tell you that when you have one or two great players around it often lifts the quality of everyone else around them. By being able to read, compose, arrange and improvise music, having Alpha trained players in a recording session would almost guarantee a higher caliber end product and they worked their magic on literally thousands of recording sessions. Heather: This is always the big question in terms of any of the people involved in shaping Jamaican music—what if? What if Duke Reid or Coxsone or Ken Khouri or anyone who was a champion of music during their specific time hadn’t done what they’d done, would it be the same? No. And so it goes with Sister Ignatius—she saw the potential that music had for her boys, and like any mother, she nurtured that talent in her boys, to provide them with education, opportunity, and a means to make a living. What those boys did with that gift was their own, and so each went on to take those ingredients to make their contributions to jazz and ska and rocksteady and reggae and dub and dancehall. Remove Sister Ignatius from the equation and you be the judge—would it be the same? I think Adam and I argue, through the subtext of the book, that it would not. Would these genres exist? Yes, probably, because there were a number of non-Alpha musicians who were creating and contributing, like Carlos Malcolm, Sonny Bradshaw, Jackie Mittoo, and dozens of others in addition to the studio men and women. But the music wouldn’t be the same without Sister Ignatius. That is undeniable. For the ska fan, a list of Alpha alum reads like a who’s who—Tommy McCook, Johnnie “Dizzy” Moore, Lester Sterling, Don Drummond, Rico Rodriguez, Sparrow Martin, Winston “Yellowman” Foster. Share something new your research taught you about one of the Alpha School greats. Heather: Where do I start? That’s the beauty of researching is that you discover. I know you asked for one of the greats, but I am going to rattle off a little list instead, if you don’t mind, starting with the bandmasters. The iconic Alpha band sign had a little list of some of them, but I really knew little about the bandmasters. By digging deep on this chapter of the book, I think I was finally able to rediscover who they were and how they contributed to the band. I learned that there are names we seldom hear anymore outside of jazz circles, like Leslie Thompson, Sonny Grey, Bertie King, Joe Harriott, Dudley Farrier, and Bobby Gaynair, who were arguably just as titanic as the names with which we are more familiar, and they are relegated to obscurity. I wanted to make sure that did not happen. Perhaps the one I feel most strongly about is Bobby Gaynair because through my research, I was able to combine my findings with the work of researcher and writer Roberto Moore to arm Jamaican Music Museum Curator Herbie Miller with what he needed to appeal to the Jamaican government to award Gaynair with an Order of Distinction. Bobby Gaynair received that award for his contribution to his country’s music, the highest honor bestowed upon a Jamaican, in October 2017. It doesn’t get any better than that, to see a musician finally recognized, albeit at 82 years of age, for their lifetime of work. Adam: Well, one great little Alpha story that I was told by Eddie ‘Tan Tan’ Thornton is that he played a hand in putting The Jimi Hendrix Experience together. Tan Tan was right in the heart of swinging ’60s London, playing in the coolest clubs of the day like the Flamingo Club, The Marquee and The Roaring Twenties as part of the hottest rhythm ‘n’ blues bands of the era, Georgie Fame and The Blue Flames. 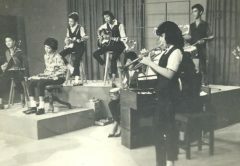 Tan Tan ran with an elite group of musical friends including members of The Beatles, The Rolling Stones, The Small Faces, The Animals and The Yardbirds. He did trumpet work for all of these bands, even the Beatles. That’s him blowing on Got To Get You Into My Life. The song Eddie’s Dreaming by The Small Faces is about him. In 1965 Tan Tan lived in an apartment in a swanky part of central London with the drummer from the Georgie Fame and The Blue Flames, Mitch Mitchell. Tan Tan’s friend Chas Chandler from The Animals had been in the States and brought back with him an unknown guitarist who he wanted to launch on the London live music scene. That was Hendrix. Tan Tan be-friended Jimi, took him to the cool hangouts and introduced him on the London scene. The Blue Flames had recently split up and their drummer Mitch Mitchell was looking for his next gig. Tan Tan linked him with Hendrix, suggesting him as an ideal drummer for the band Jimi was putting together. The rest is history. Alpha did not just produce ska and reggae artists. Tell us about some of the other alum who made their mark in the music world. Adam: The earliest Alpharian to make any real impact was Leslie Thompson who took the Harlem-style jazz of Cab Calloway to Londoners in the early 1930s with his own band. Saxophonist Joe Harriott is considered to be a titan of jazz and I think what he did was truly remarkable because he changed music not once, but twice. He made the first free-jazz record, the discordant style later to be made famous by Ornette Coleman and Sun Ra. He also recorded the first ethno-jazz fusion record, mixing Indian classical music and jazz. So a real pioneer, but sadly he ended up penniless and died alone in oblivion. Heather: Before ska there was jazz, and the 1930s, 40s, and 50s were times when jazz musicians were in demand, so there were many who both worked in the dance clubs in Jamaica, as well as in England, France, and Germany. Harold McNair was an interesting guy. I think he would have been a fun person to know because while jazz musicians can sometimes, and I’m going to generalize here, seem serious or mysterious or even gloomy at times, McNair brought a sense of whimsy to the music, and I think jazz and ska and any music for that matter, needs a little balance of seriousness and humor. At least it’s that way for me, or I can find myself in a heavy place. McNair, or Little G as he was called, was a serious musician, proficient on the alto and tenor saxophone, as well as the flute. He performed with all the important bands of the 1940s and 1950s, he directed his own band, and he toured all over the world. He was a musician, but he also sang. He sang calypso and called himself Digby. He performed with Quincy Jones’s band, and with Charlie Mingus. You know that little flute part on Donovan’s “Mellow Yellow?” That’s McNair. He performed flute on a number of Donovan tunes. These performances were whimsical enough, but the humor of McNair comes in his album titles, providing us with a glimpse of who this guy was—“Affectionate Fink,” and “Flute & Nut.” To me, McNair was the consummate musician because he embodied so many different aspects of music. I would have liked to have known him. For every big name musician to pass through Alpha, there were scores of other talented musicians who aren’t as well known. Can each of you share the (brief) story of one of those lesser-known artists? Adam: One of the most interesting Alpharians is Vernal Kelly, better known as Charlie ‘Eskimo’ Fox. Charlie grew up in the hills playing percussion among his family and the spiritual community he was part of, drumming every day in ceremonies that would go on for days or even up to a week at a time. He didn’t join the Alpha band, preferring to tread his own musical path. He came to England in the late 1960s, a move he found highly traumatic. His parents bought him his first drum kit to help him get over the shock and he soon became part of the nascent London reggae scene. Charlie Fox went on to become a key contributor to experimental reggae label On-U Sound’s prolific late 70s and 80s output, headed up by gifted young producer Adrian Sherwood. On-U Sound was as much influenced by post-punk, kraut-rock and industrial music as it was by the likes of Lee Perry and King Tubby, creating highly danceable but pretty way-out abstract reggae soundscapes. On-U Sound worked more like a collective, with a sprawling family of musicians who all worked in each other’s bands. Charlie Fox played in Creation Rebel, New Age Steppers (with Ari Up of punk band The Slits), African Head Charge and Singers & Players. All their records are hugely innovative and have proven to be influential to an entire generation of bass-heads. The first four African Head Charge LPs make for especially challenging listening and really sound like nothing else on Earth. Heather: One I’d like to highlight here is Vernon “Von Mullo” Möller who was a trombonist, a contemporary of Joe Harriott, Harold McNair, Wilton and Bobby Gaynair, Sonny Grey, and Tommy McCook. He performed with all of the swing jazz bands of the day, like Eric Deans and Roy Coburn, and he was a member of the Jamaica All-Stars Band with Sonny Bradshaw, Carlos Malcolm, and Don Drummond, and he performed regularly with Byron Lee & the Dragonaires. But I think where Von Mullo’s story is different from the others is that he helped to put Bahamian music on the map. Yes, that’s right, Bahamian music. Von Mullo moved to the Bahamas and he performed with the Freddie Munnings’ band, The Beginning of the End. This band was tremendously popular in the Bahamas, as well as throughout the Caribbean. Their song “Funky Nassau” was a massive hit in 1971 and it featured Möller on trombone. It reached #7 on US R&B charts and charted in the UK. A year later, Toots & the Maytals came out with “Funky Kingston,” perhaps inspired by Von Mullo’s tune? He formed his own band, The Explorers, and they had a residency at the famous Xanadu Hotel. For decades, Alpha School helped prepare students for careers playing in police bands and for hotel orchestras—two career paths that are pretty much gone. How has the school responded to the changing nature of music performance? What’s the future of music instruction at Alpha School? Heather: Alpha Boys’ School is no longer. It is now Alpha Institute, so their boarding school closed. They are developing a music studio to teach boys about all facets of music technology and Sean Paul recently donated $1 million Jamaican to help these facilities bring an education in audio arts to boys. They are learning about music engineering and radio broadcasting, and these are two viable areas of employment in Jamaica. In a country where nearly 40% of young men aged 20-25 are unemployed, adapting training to accommodate career needs is crucial. To see the foundation of Alpha Boys’ School become part of history is sad indeed, but it would be even sadder to see it fail the very boys it was meant to help. Ska fans and musicians owe something to Alpha School. How can we give something back? Adam: If any socially conscious entrepreneur out there wanted to create an Alpha-themed record label, I’ve always felt there was scope for Alpha-branded releases, both vintage and new. Something like this is long overdue in my opinion. Adam: Approaching a subject this big could have been quite overwhelming but by just covering one musician at a time it became attainable. As you dip into the book, little by little a picture is buildup of something truly colossal, but it’s only through these individual stories that the sum of their parts is fully appreciated. Heather: Buying an Alpha t-shirt is easy, from their website or from etsy where they have a storefront. I visited the screen shop in 2017 and it was quite an operation—they produce all sorts of printed goods, including clothing and bags. I should note that a percentage of our book proceeds will be donated to Alpha Institute, so you can always purchase one of our books! To make a larger monetary donation, contact Sister Susan Frazer who heads the school today [or click here]. Shockers Rock by The Skatalites, Richard Ace and Disco Heights. It’s a funky dubbed-out eight minute discomix of The Skatalites’ heavyweight tune Cleopatra Ska Originally a 12″ single, it’s available on Studio One Scorchers Vol 1 on Souljazz Records. From his 1977 LP Man From Wareika, it has majesty and deep spiritual yearning, which was Rico’s trademark. Devil’s Triangle by The Skatalites from the Rolling Steady LP. Recorded in 1983, it was the only time all the surviving original members came together. The tapes disappeared for about 30 years, allegedly because Jackie Mittoo ran off with them due to internal disagreements. The tapes re-surfaced and were salvaged and restored at Abbey Road Studios at great expense. The whole album is simply stunning. More Creation by Lennie Hibbert. Super funky vibraphone business by one of the greatest of Alpha’s bandmasters, played over Studio One’s Sidewalk Doctor Riddim. It can be found on Studio One Roots Vol 1 by Souljazz Records. Can’t Buy Love by Johnny Osbourne, on the Swing Easy riddim. There is a 3-part discomix version of this which appears as a bonus track on the Truth And Rights deluxe CD edition. It features an extended dub which then cuts into the original rocksteady instrumental, Swing Easy by The Soul Vendors. It has a Yiddish klezmer vibe about it, which is largely due it being a cover of the theme tune to Fiddler On The Roof. So you have Osbourne, an Alpharian singing over the riddim in 1979 and then the original mid-’60s track featuring an Alpharian horn section, so the track goes full circle.